We have been set the task to create a 5 picture portfolio. These images have to be related and able to express meaning and depth, as well as being technically impressive. I will use this blog to document my thought process in trying to produce the best 5 pictures I possibly can. Enjoy. I started this project the same way I start every creative task; thinking of an idea. I made a list of all the themes I could address in my project. I found my list to contain the stereotypical student photographer themes; gender, identity, poverty and so on. I decided to change my plan of action when we were told to bring in our personal favourite picture. I choose a picture I took first year. The reason I choose it was because it reminds of the potential of photography. I was playing around with taking pictures through a 5 panelled water glass, I got one of my friends to pose in the centre of the shot. I was shocked by how effective this technique was. The water glass created a surreal distorted effect, that created a twisted narrative for the subject in the picture. This picture reminds me that photography can be used to create an artificial reality that can leave powerful messages. I don't want to necessarily do my whole project based on this one picture I took, but it has reminded my to base my portfolio on something I find interesting, therefore something I can pour passion into, and really get submerged in. I will continue to search for an idea. 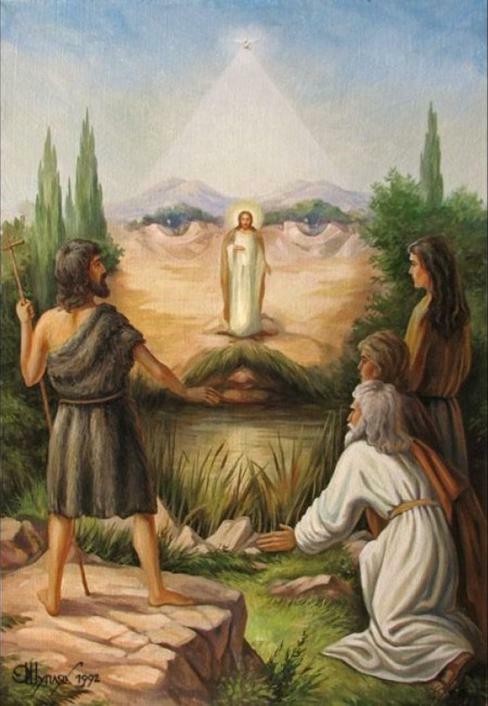 Jesus's face hidden within a painting. The other night as I was falling asleep, an idea came to me. The concept of hidden messages/ images is something I have always found fascinating whether it be in literature, art or film. I love the way poetry tells a story, but hidden underneath that story there are other themes and narratives. The same applies for film, in particular the works of Hitchcock, who in my eyes is the master of creating films with layers. For example, his 1958 masterpiece; Vertigo tells the story of a retired policeman trying to solve a crime. Hidden in this film Hitchcock explores ideas of Freudian analysis, themes of gender representation, and even Laquan's mirror theory in understanding voyeurism. His films are so rich with hidden messages, that its no wonder why he is considered one of the best directors to have lived. I am also interested by the work of Michael Haneke, who has shown again and again that he is the master of subtle political messages within his films. Cache (2005) which translates into 'hidden', is an example of his cunning imagery. The film at a first glance is about a married couple who are terrorized by a series of surveillance videotapes left on their front porch, but the message Haneke hides in the film is about France's national guilt towards the Paris massacre of 1961 during the Algerian War. Haneke portrays this by using metaphors, such as a beheaded cockerel throughout the film . 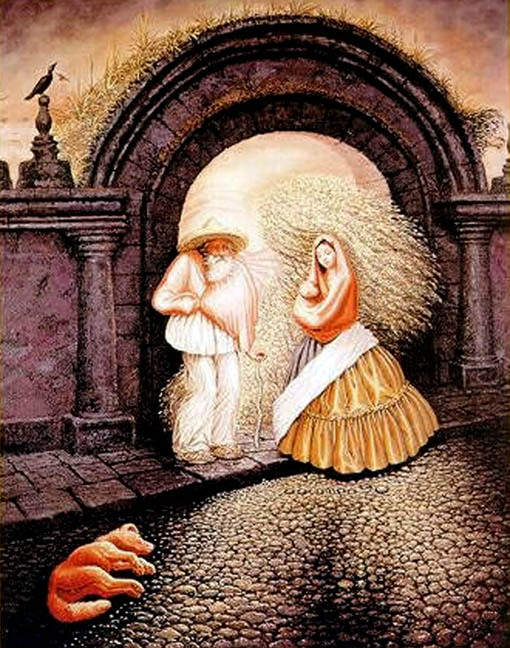 This is obviously a photo project, so I have looked at paintings with hidden images within them. I believe this will be a really interesting way to express ideas, to find beauty from something that appears rancid and an exciting project to develop. I have attached a painting of an example of the kind of composition I am thinking of recreating through photography. I have started to do more research on images hidden within paintings. I have found that a lot of images follow a similar style. They use full body humans in certain environments to create a hidden portrait of someone's face. 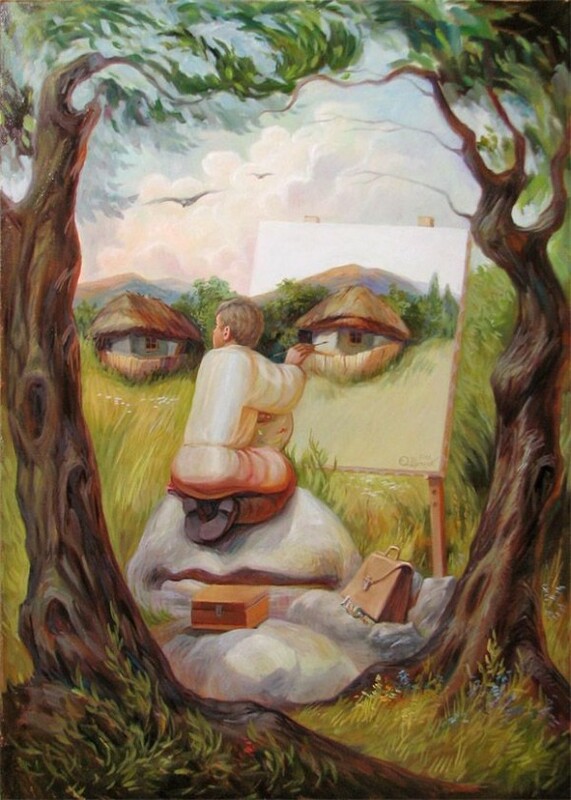 I think it is really interesting to see what the artists have used to create the portrait of the face, as I believe reflects on the message they are trying to create. I have started to put some thought into the meaning I want to create through this style. I really like the idea of showing the beauty in a not so appealing location or situation. I'm thinking about doing this through portraying immigrants / refugees suffering with life in Britain, but reconnecting to their cultural past. An example of this would be; an Indian family sitting in a dull and grim British council house living room. The look on their faces is off depression and suffering. However, the positioning of their bodies and the content of the room, create the image of an Indian elephant. suggesting that they haven't forgotten about their culture roots, and that there is beauty in darkest of places. I want to create the message of hope, but at the same time comment on how westerner's see immigrants / refugees. I understand that if am to create photos in a similar style to these paintings, it is going to take serious planning, and excessive use of Photoshop to achieve the desired look. Due to how precise everything in the shot has to be, shooting in controlled conditions (studio or inside) will be necessary. I will do further research to see if this style I am trying to create is possible. I'm tempted to find more poems that address migrants losing their culture within British society and create visual representations of them. Doing this will add more depth and meaning. Its been a while since my last post, A lot has changed! I put together draft drawings of the images I wanted to take, i.e a man at the grave of his father combined with the surroundings creating his father's face. On paper this idea looked really promising. I started to put together a few practice compositions from images I found on Google. I quickly discovered that this was a lot harder to do than I originally thought. There are so many things you have to take into account; lighting, tone, shadows, highlights, image size/ quality, blur and many more. This made me question my Photoshop ability, I don't like to back down from a challenge, but taking this on could have very likely jeopardized my whole project and left me frustrated with 5 images that I invested hours and hours in, but wasn't happy with due to my lack of my Photoshop ability. So I decided to back to the drawing board. I still wanted to keep the theme of hidden images that express an emotion, I just needed to find a simplified way of achieving this.I knew I was going to be at home during the majority of Christmas, so I started thinking of ways I could use that to my advantage. I basically live in the middle of know where, which is surrounded by what feels like a never ending forest. I knew I could get some really interesting images there. So now I have somewhere to take the pictures, the next step thinking of a theme that links back to my original idea. So now I had the subjects, I had to think of ways to relate this to my old theme. I did some research about mystery in woodland, and I discovered a character called the Green Man, he is followed by several cultures, and is seen to be in charge of the forests and a symbol for rebirth. His physical appearance, is that of a man, who is hidden in shrubbery and leave. That made me think, I could hide the images of my women, in wooded area, suggestively where their bodies were found. I am stating that the woman have become part of the forest. By framing their faces throughout different woodland scenes in an elegant style I can suggest that their ghostly presence remains. I will be showing a literal metaphor of their memory within the woods. I will use the idea of the Green Man being a symbol of rebirth, as we see the woman being reborn into a daunting yet beautiful woodland, hopefully this will create a chilling effect. I also like the idea, that this project will keep the memory of woman going. Even if only two people see the pictures I have produced, it still helps preventing the name of these woman being forgotten. I will also be able to keep the theme from my original idea of having a hidden images. I will make the images seem at first glance a normal picture of a woods, but when you take a closer look you will spot a the face of a woman. This will encourage the audience to concentrate on my images. I went on several trips into the woods, took a variety of images, trying to avoid any messy backgrounds (makes editing harder), filled up the memory card, and then went out and did it all again. I was finally happy with the range of pictures I got, I was just short of 400 overall. I then started to put compositions together. I started by experimenting, and working out ways I could make this work. I used YouTube to find methods that I could use, and found a useful video for adding faces over different textures. This process is known as displacement; its when you blur the layer of the background you want to use, and then save it as a separate file. You then apply this saved file to the face you want to use, in theory the face then takes on the shape of the background, I didn't always find this to work however. Once you have your displaced face layer, you have to change its layer settings to multiply, this increases the contrast, to counter this you duplicate this layer and change the layer settings to overlay (I also found colour dodge to work nicely). Once you have done this you play around with the opacity settings until you find the look you want. I used this technique for three of my images. For the image of Vicky (clouds) I painted Vicky's face into a cloud scene I created. For this I had to create a custom brush to create the perfect brush effect. Once I was happy, I put it on top of the image I had taken of the sky. This is when it got complicated, my image of Vicky had very different colouring and levels to the picture I had taken. So I had adjust all the settings, and uses the clone tool to blend the images together. I then darkened the whole picture and added a moon in to create a haunting effect.